Celebrating a 20-Year Video Anniversary! In 1992, I spoke at a seminar in the St. Louis area. A young ministerial student, not yet married, purchased a set of videos featuring Dr. Gary Parker and me called Understanding Genesis. That video set—plus the seminar he attended—gave him a very strong foundation for his future pastoral ministry. 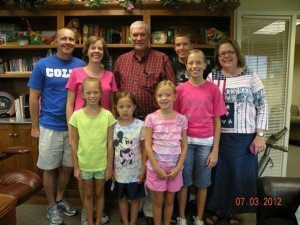 Earlier this month, I was very happy to welcome Pastor Mark Byars and his family to the museum. (See the photo below taken in my office.) There is more to the story about the videos he purchased 20 years ago. In the mid-90s, Mark’s father-in-law, Floyd Coates of Indiana, visited Mark’s house in Illinois, and Floyd noticed the yellow-jacketed Understanding Genesis VHS series. Floyd started to watch them, and very soon, Floyd was hooked on biblical apologetics. Over the years that followed, Floyd gave over 300 creation presentations to young people and adults, including in smaller communities. He also brought along a lot of AiG materials. Floyd reached several thousand people at his live events. I am sad to report that this wonderful “creation evangelist” passed away earlier this year. During the memorial service, attended by two of our staff, it was mentioned many times that Floyd, though heading up a large business, made it a high priority to speak wherever and whenever he could on the book of Genesis. Floyd and his wife Anne visited the Creation Museum many times. In this photo taken earlier this month, you can see Anne standing with her daughter (Becky), son-in-law Mark (who bought the video set in 1992), and their five children. 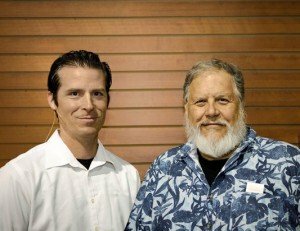 What a wonderful legacy of apologetics that Mark, Floyd, and Anne are passing on to another generation, starting with videos 20 years ago that Mark bought. Left to right are Mark and Becky Byars, me, Tyler, and Anne Coates; front row: Savannah, Bailey, Mariah, and Brooklyn. I gave a copy of our new DVD series to Mark so he could replace the VHS set. For more information about the Foundations DVD series, visit our online resource store. Praise the Lord for the several thousand people that Floyd personally touched with the message that the Bible is true from the very first verse, all because of a seminar 20 years ago that Pastor Mark attended! When many of our AiG speakers are out on the road at the same time, such as this week for our national conference in Branson, Missouri, it leaves some gaps to fill back at the Creation Museum for our special lectures that are held at noon and 3 PM. For the past three summers we have welcomed Tom Meyer of Wordsower Ministries to conduct some of his special programs at the museum while many staff are away. Tom has memorized huge portions of Scripture, and this past week, he recited all of the book of Revelation from memory for our museum guests at five presentations, alternating with reciting Genesis chapters 1–11. Tom travels the United States to give his Bible recitations to churches and groups, and he also teaches at Shasta Bible College in Northern California. For months at a time, he can sometimes be found studying in Israel. On Wednesday here at the museum, he was paid a surprise visit by the Wordsower president, Jason Nightingale, who attended Tom’s 3 PM presentation in Legacy Hall. Here is a photo of Tom and Jason inside the museum. Previous Article Your Work Is Making a Difference Next Article Lots of “Wow” Happenings!